For a moment, it seemed like the months of hard work spent transforming the 421-a tax abatement program into an engine for affordable housing would come crashing down. After the program emerged from the State Legislature in late June, Mayor Michael Bloomberg felt his plan had been so changed that he asked the governor to veto it if no compromise could be reached. And as often happens in Albany, a last-minute deal was struck on August 7, “a positive result for affordable housing in New York City,” said the mayor in a statement. “I’m happy with the final outcome of the bill,” said Assemblyman Vito Lopez, architect of the bill the mayor opposed. “We didn’t get everything we wanted, but we’re happy.” Namely, the city’s demands for middle-income housing have returned, whereas Lopez wanted the program to only benefit low-income families. Some New Yorkers are still missing what they most wanted, though. Under the June bill, Forest City Ratner’s (FCR) Atlantic Yards development received what critics are calling a “carve out” that could have netted the developer $300 million. Even though he is a supporter of the project, the mayor had threatened to revoke city funds, arguing that Ratner’s windfall would be the city’s loss. Instead, he balked and knocked the subsidies down to $200 million with the guarantee that affordable housing would be built during each phase of the project instead of at the end, when critics claim Ratner could renege on promises due to lack of funds. Central to the debate are the boundaries of the zones that are excluded from eligibility. The 421-a program, created in 1970 to spur residential development in a beleaguered city, was so successful in parts of Manhattan where the market was strong, an exclusion zone was established. To gain tax breaks within those areas, developers had to create affordable housing equivalent to 20 percent of the units in the project. Mayor Bloomberg decided two years ago to expand these zones to encourage affordable housing, which would now have to be built onsite within an exclusion zone that would encompass most of Manhattan, and the Brooklyn/Queens waterfront. The City Council expanded that zone, as did the legislature. Lopez expanded the zone to all of Manhattan, and every borough has one. Developers outside the exclusion zone still receive the tax abatement as-of-right. The Bloomberg administration hopes to negotiate the exclusion zone when the legislature reconvenes next year—they think the latest additions will see a lack of necessary development—but the city is happy with its larger victory, the inclusion of middle-income projects like Queens West and Willets Point. Now developers must make a percentage of units affordable to 90 percent of the area mean income, though this is actually an average that extends between 120 percent and 60 percent. “It’s one-for-one,” Lopez said. “For every middle-income unit, there will be a working-class one.” Coleman estimates this will help realize 10,000 units the city had planned but feared lost under the new rules. Williamsburg assemblyman Vito Lopez considers himself a crusader for affordable housing, driven largely by his front row seat to the vagaries of gentrification. To further this mission, Lopez helped pass a new version of the 421-a residential tax abatement program in the Legislature on June 21, where it drew votes from all but two senators. City officials, however, including Mayor Michael R. Bloomberg and City Council speaker Christine Quinn, are galled by what they see as last-minute changes Lopez wrote into the bill. Both have called on Governor Eliot Spitzer to veto it, though Neill Coleman, a spokesman for the city’s Department of Housing Preservation and Development (HPD), said the city hopes to negotiate instead. “What we’re looking to do is try and get changes made before it goes to the governor’s desk,” he said. 421-a refers to a section of the real property tax code created in the 1970s to encourage large-scale residential construction in the city by abating taxes for up to 20 years. In 1985, an exclusion zone was created in central Manhattan that required developers to include 20 percent affordable housing to secure tax breaks, resulting in 10,000 affordable units over 20 years. Last year, the mayor convened a task force to reconsider the plan. As once-downtrodden neighborhoods succumbed to gentrification, developers were able to use 421-a to fund luxury housing, and this has cost the city hundreds of millions of dollars in taxes. A version of the mayor’s plan, which greatly expanded the exclusion zone, passed City Council on December 28 (“City Revises Property Tax Program,” AN 01_01.17.2007). Coleman said three things are at issue in Lopez’s bill, the most prominent of which is a clause that includes Atlantic Yards in the program. The deal could net Forest City Ratner $300 million, according to HPD numbers. “It’s $300 million they don’t need,” Coleman said. Finally, HPD objects to a provision that prevents projects with “significant government assistance” from receiving 421-a benefits, arguing that it could hamper the city’s plans for middle-income projects such as Queens West, from receiving tax abatements. Coleman said it could stall 10,000 units currently underway. When the Brooklyn Academy of Music decided to throw its cultural heft into remaking its then-dingy neighborhood, it did so the BAM way, i.e., con brio. With a master plan from Rem Koolhaas’ OMA and Diller + Scofidio, and renderings of a state-of-the-art new public library by TEN Arquitectos, the future looked glamorous. And while it took almost nine years, new architects, scaled-back projects, and some political shifts, several significant pieces of the plan are about to go forward. By Alan G. Brake. When the Brooklyn Academy of Music burned to the ground in 1903, the New York Times opined, “In short, there has hardly been a great public movement of national import but the old Academy has been at one time or another its principal focus.” BAM quickly relocated from Brooklyn Heights to its present location on Lafayette Avenue in Fort Greene where it has enriched the city’s cultural life for more than a century. Over the last ten years, however, BAM has added an unusual element to its portfolio of offerings, and that is neighborhood redevelopment. In 1998, Harvey Lichtenstein began to move out of his position as the institution’s director, and looked outward at the neighborhood. It wasn’t pretty: The 1970s and 1980s had not been kind to Fort Greene and downtown Brooklyn, and one of the most respected performing arts organizations in the country found itself surrounded by a nondescript mix of parking lots, liquor stores, and not much else. But with a location near commercial hubs and lots of subways, there seemed to be no reason why the area couldn’t come back. Lichtenstein formed the BAM Limited Development Corporation (LDC) as a catalyst for the transformation of the ten or so blocks immediately around the theater into an arts district. The organization hired New York’s Diller+Scofidio and the Rotterdam-based OMA to develop a conceptual masterplan in 2000. Two years later, it held a competition for a Visual and Performing Arts (VPA) branch for the Brooklyn Public Library; the jury chose TEN Arquitectos, and images of an ship-like building were published everywhere. But things seemed to slow down soon after, and there wasn’t much news from the intersection of Flatbush and Lafayette Avenues. In 2004, WORK AC quietly took over the planning job. “The Diller +Scofidio/OMA masterplan still provides the basis for what will be built,” says principal Dan Wood. Wood founded WORK AC after leaving OMA and continued to be involved in the project. The main innovation of the latest version is shifting the site of the Theatre for a New Audience, a respected Shakespearian company, to Layfayette Avenue, next to the Mark Morris Dance Center and catercorner from BAM, opening up space on Lafayette for a substantial new park with the working name Grand Plaza. Toward the end of the process, WORK AC brought in Ken Smith’s firm to consult on open space and streetscape plans. The Grand Plaza will act as a front door for three of the major cultural institutions, making it a sort of Lincoln Center stitched into the fabric of brownstone Brooklyn. Parking will be built under the plaza and will match the existing number of spaces. “The modified plans allows us to create a park where you want to be, not just a remnant patch,” says Christian Gabrial, a designer at Ken Smith Landscape Architecture. 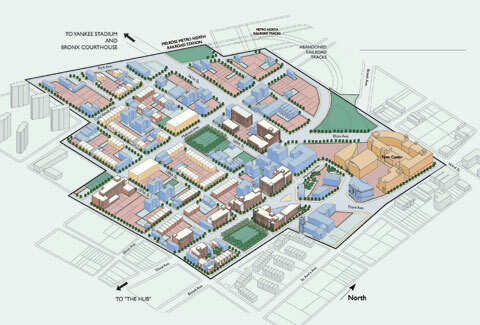 After the masterplan was complete, the teams switched roles to further develop the open space and streetscapes, with Ken Smith’s team as the prime consultant and WORK as the subsidiary. “A lot of time and energy are going into the streetscape, which will have a key role in pulling the district together,” says Louise Eddleston, a designer at Ken Smith. “The district is primarily residential and with more units of housing going in it will remain that way.” She says the short blocks and intimate scale of the neighborhood have to be understood and used to their best advantage. The firm will present schematic designs to the Economic Development Corporation in the Fall, and hopes to get the contract to build the project. The move is yielding results. Though the VPA library was recently declared all but dead by the Department of Cultural Affairs Commissioner Kate Levin due to lack of fundraising on the part of the Brooklyn Public Library, several other significant projects are moving forward in the district. Along with the streetscape design, a revised design for the Theatre for a New Audience is in the works by Frank Gehry and the H3 Partnership, and the department of Housing Preservation and Development just concluded an Request for Proposals for a new mixed use building that will house Danspace, the contemporary dance incubator. All of this is happening in the shadow, metaphorically speaking, of Forest City Ratner’s controversial and gargantuan Atlantic Yards development. While coordinating multiple city agencies and cultural groups and meeting fundraising goals has somewhat slowed and altered development, the district’s largely positive reception in the community speaks to the thoughtful and neighborly scale of the project, as well as a flexible, piecemeal approach. The subtle way in which increased cultural programming,open space,and higher density are being woven into the neighborhood could prove to be a model for the borough and beyond. It also shows that Brooklynites aren’t averse to change, they just don’t like to get steamrolled. A brownfield in the South Bronx is about to be greened, thanks to a sustainable housing competition conducted by the Department of Housing Preservation and Development (HPD) and AIA New York. An architect-developer team consisting of Grimshaw Architects, Dattner Architects, Phipps Houses, and Jonathan Rose Companies won the competition with a proposal to design 202 units of housing along with commercial and open space on a long, narrow 60,000-acre site. The city is giving the property, a vacant lot and abandoned rail right of way, to the development team for $1 to underwrite the project’s affordability requirement. Named Via Verde, or the Green Way, the project includes an 18-story tower, midrise units, and townhouses, “threaded like a ribbon through the site,” said Vincent Chang, senior architect at Grimshaw’s New York office. More than half of the housing, which is a mix of rentals and units for sale, will be reserved for low-income residents, with the remaining portion set aside for moderateand middle-income residents.“We were keen to create a sense of continuity across unit types,” he said, though the facades of each building volume will use varied materials in a prefabricated, extra-insulated cladding system. The buildings are arranged around the perimeter of the site, creating a courtyard in the middle. Green roofs and gardens are designed for each building, and the terraced building heights allow for travel between each building volume. Geothermal groundloops for heating and cooling, photovoltaics, daylighting and cross ventilation, and an on-site farmer’s market will be employed so that the project can achieve LEED Gold certification. While this might seem like using every trick in the green bag, Chang stressed that the approach is “holistic.” Practical steps such as granting residents control over the HVAC systems in their units so they can better monitor their individual energy usage combine innovative sustainable technology with thrift and common sense. “We thought a lot about the sense of community and vibrancy in an urban environment,” said Chang, “however, in those environments access to nature is often lacking, so that really became the driving force of the design.” The team is working with the landscape architect Lee Weintraub to design a series of passive, productive, and recreational gardens, green roofs, and open spaces that will be open to every unit, which will also provide insulation and reduce storm water run-off. The Grimshaw/Dattner/Phipps/Rose team prevailed over four other notable teams, including: Rogers Marvel with BRP Development Team and the Bluestone Organization; Magnusson Architecture and Planning and Kiss + Cathcart with the Dermot Company, Nos Quedamos, and Melrose Associates; Behnisch Architekten and studioMDA with seg, Full Spectrum, and Hamlin Ventures; and Cook + Fox with Women’s Housing and Economic Development Corporation and Durst Sunset. Thirty-two architect-developer teams responded to the request for qualifications, which were reviewed by a jury that included Enrique Norton, principal, TEN Arquitectos; David Burney, Commissioner New York City Department of Design and Construction; Bronx Borough President Adolfo Carrion, Jr.; and Shaun Donovan, commissioner of HPD. “We were so honored to be among the company of the finalists,” said Chang. “We can’t wait to get started.” Construction is expected to begin in mid 2008. Do Green Buildings Live Up to their Promise? the 1999 project by Fox & Fowle for the Durst Organization, turns up dozens of articles celebrating the buildinggs green systems. Many of these reports brim with statistics documenting environmental and economic savings. But these numbers are not drawn from Con Edison bills or studies by the buildinggs owner or tenant. They come from engineerrs projections and computer simulations. In fact, the measurements that inevitably pepper the press releases of any high-performance building ((consumes 25 percent less energy than a standard building,, reduces water consumption by 30 percent") nearly always circulate before the buildingss completion, and are rarely verified post facto. In attempting to find hard data about some of New Yorkks landmark green buildingsssuch as the Audubon House, the NRDCCs national headquarters, 4 Times Square, and the various developments of Battery Park Cityywe were surprised that neither the projectss clients, architects, nor developers undertook post- occupancy analyses of any sort. In fairness, post-occupancy evaluations (POEs) rarely occur for any building, and the idea of testing efficiency is as new as the notion of designing for it. But given the hype, LEED plaques, tax credits, research grants, and payback promises of supposed sustainable buildings, it is surprising that monitoring of any sort is basically nonexistent. Because of the pioneering nature of many of the technologies associated with green building, metrics can make a big difference in facilitating their broader acceptance. Architect Colin Cathcart recounted that his firm, Kiss + Cathcart, was unable to gain the Department of Housing Preservation and Developmentts approval to install a geothermal system at the Pitt Street Residence, a Common Ground project, because the agency insisted on seeing evidence of the technologyys energy savings. We tried to get data from the Center for Architecture about its system, and also for Historic Front Street [a project by Cook + Fox, with residential units completed a year ago] but nobody has tracked their energy savings,, he said. John Krieble, director of sustainable design at the New York City Department of Design and Construction, which is pushing for its projects to undergo POEs. This is hardly a new idea. In the 1970s, when Sim Van Der Ryn was the state architect for California, he tried get a POE program off the ground, but it never got any traction,, he said. He added, Clients would look at anything that wasnnt working as their fault,, not to mention a wrongheaded investment. In the case of 4 Times Square, tenant Condd Nast nixed plans for a POE, according to employees at FXFowle, fearing litigation if their old offices proved to have been comparatively unhealthy. far worse. The appropriate corrections have been made and everything now functions as planned. Our national interest in building science is zero,, he said. We know squat about how any building works, including LEED buildings. If we sent our cars out on the road with the checks we provide buildings, customers wouldnnt stand for it..
On October 11, Mayor Michael R. Bloomberg announced that he would endorse recommendations to take a 35-year-old tax incentive program aimed at spurring residential development of all types and refocus it on encouraging affordable housing. The recommendations came after months of research on the part of a special task force convened in February. However, some of its members who supported modernizing the program, which is known as 421-a, now question whether the changes may actually hinder affordable housing construction. 421-a is an incentive program designed to encourage large-scale residential development by offering tax abatements for up to 20 years. As the program spurred development in Manhattan’s Midtown and Uptown and more recently Williamsburg/Greenpoint, those areas became exclusion zones wherein developers could not receive tax abatements unless they provided affordable housing on-site, or outside the zone through a certificate program. Affordable housing advocates have seized upon this part of the program, seeking to expand the exclusion zone, increase eligibility from a three- to six-unit minimum, and cap abatements at units costing more than $1 million. These are measure that both for-and non-profit developers agree upon. “One of the insanities of the current policy is the more expensive [the housing] you build, the more subsidy you get,” explained Ingrid Allen, a task force member and professor at the Furman Center for Real Estate and Urban Policy at New York University. The point of contention is the certificate program within 421-a. It offers tax breaks if developers fund one dollar of affordable housing outside the zone for every five they spend within it, allowing them to fulfill their obligation without incorporating the affordable units in new developments. Under the current recommendations, the certificates are being abolished in favor of a program that requires developers build 80 percent market-rate, 20 percent affordable on-site. The extra tax revenue generated by this move will be placed in an isolated fund for affordable housing. Department of Housing Preservation and Development (HPD) spokesman Neill Coleman explained that this plan ensures units of relative value that encourage healthy social mixing because the ratio deals with units, not dollars, which scale more evenly. The biggest fear for developers is that the city is “legislating from the top of the market,” as Allen put it. Everyone involved agrees the market was stronger a year ago, but now Community Preservation Corporation vice president John McCarthy, whose company provides loans to affordable housing developers, believes the recommendations may not be nimble enough to deal with a dip or turn in the market. It wasn`t like we didn`t agree there needed to be changes,, Real Estate Board of New York president Steven Spinola said, but he, along with many of the developers and some other task force members, worry that the pendulum has swung too far: You need the full package to make housing work in New York,, he said. If part of that package is emptied, some people won`t build..
421-a is an incentive program designed to encourage large-scale residential development by offering tax abatements for up to 20 years. As the program spurred development in Manhattan`s Midtown and Uptown and more recently Williamsburg/Greenpoint, those areas became exclusion zones wherein developers could not receive tax abatements unless they provided affordable housing on-site, or outside the zone through a certificate program. Affordable housing advocates have seized upon this part of the program, seeking to expand the exclusion zone, increase eligibility from a three- to six-unit minimum, and cap abatements at units costing more than $1 million. These are measure that both for-and non-profit developers agree upon. One of the insanities of the current policy is the more expensive [the housing] you build, the more subsidy you get,, explained Ingrid Allen, a task force member and professor at the Furman Center for Real Estate and Urban Policy at New York University. The point of contention is the certificate program within 421-a. It offers tax breaks if developers fund one dollar of affordable housing outside the zone for every five they spend within it, allowing them to fulfill their obligation without incorporating the affordable units in new developments. Under the current recommendations, the certificates are being abolished in favor of a program that requires developers build 80 percent market-rate, 20 percent affordable on-site. The extra tax revenue generated by this move will be placed in an isolated fund for affordable housing. Department of Housing Preservation and Development (HPD) spokesman Neill Coleman explained that this plan ensures units of relative value that encourage healthy social mixing because the ratio deals with units, not dollars, which scale more evenly. The biggest fear for developers is that the city is legislating from the top of the market,, as Allen put it. Everyone involved agrees the market was stronger a year ago, but now Community Preservation Corporation vice president John McCarthy, whose company provides loans to affordable housing developers, believes the recommendations may not be nimble enough to deal with a dip or turn in the market. What really has both developers and affordable housing advocates concerned is that without certificates, there is one less way to subsidize housing outside the exclusion zone. Presumably, the newly created HPD affordable housing fund will support more affordable housing than the certificate program. But some, like Carol Lamberg of the housing advocacy group Settlement Housing Fund, believe the certificates, while inefficient, would be better than money that cannot be guaranteed as substantial and secure.. And then there`s politics as usual. Mayor Bloomberg`s been great on housing,, Spinola said, but what about the next administration?? The local chapter resurrects its housing award program. As Anna Holtzman discovers, this year's jury champions affordability. 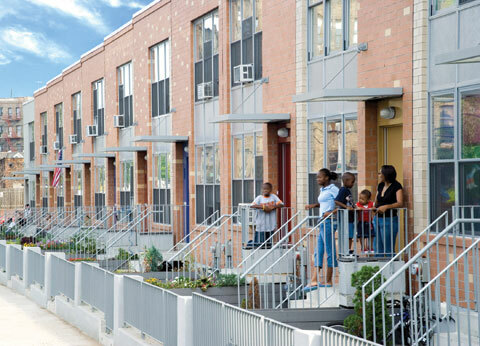 Murphy Burnham & Buttrick's Bronx Row Houses, designed for Habitat for Humanity. 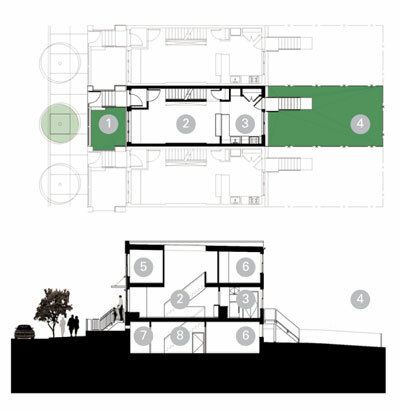 a backyard, three bedrooms, and a skylight-topped stairwell. >I don't expect this project to be published in the magazines,, said architect Jeffrey Murphy of his firm Murphy Burnham & Buttrick's award-winning project. His sentiment sums up that of many architects who submitted to the AIA New York Chapter 2005 Housing Design Awards. Displayed in an exhibition at the Center for Architecture and titled Everything Housing: From Homeless Shelters to Luxury Living (open through December 3), the awards span the gamuttfrom a supportive housing development in Brooklyn by Polshek Partnership to Richard Meier's exclusive Charles Street tower. Yet the focus of the judges, and of the AIA New York Chapter housing committee behind the awards, was clearly on the unglamorous side of the shelter spectrum: affordable housing. Spearheaded by housing committee chair James McCullar, the nascent program drew 102 entriessincluding built projects and those approved for constructionnfrom which judges Julie Eizenberg, Adele Naude Santos, and Michael Pyatok selected nine awards and five citations. The New York AIA housing committee hasn't held an awards program since 1981, said McCullar, for unexplained reasons. And somehow with the Design Awards program, housing got lost in the shuffle,, he recounted. In the last few years, New York architects have been invited to submit to the Boston Society of Architects (BSA)'s biennial housing awards. [But] with all of the recent zoning changes in New York, such as the Greenpoint waterfront,, said McCullar, there could not be a more opportune time to bring local housing efforts to the forefront. Shaun Donovan, commissioner of the New York City Department of Housing Preservation and Development (HPD) and a guest speaker at the October 17 awards ceremony, drove McCullar's point home when he stated, Since 1990, New York City has added more people than the population of Boston,, creating an unprecedented need for affordable housing. 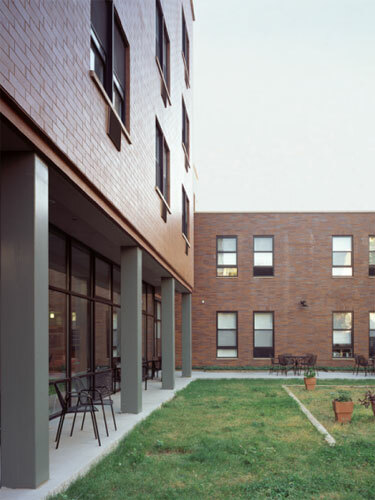 Jonathan Kirschenfeld Associates' Marcy Avenue Residence in Brooklyn serves the mentally ill.
Donovan lauded such projects as the Schermerhorn House, Polshek Partnership's citation-winning, glass-faced supportive housing project for Common Ground Community, which brings luxuriously light-filled interior spaces to a mix of low-income and formerly homeless residents. Donovan's praise was tempered, however, by a more critical take from the jury. We were hoping to see some new typologies as far as spatial arrangements and clustering of units,, said Santos, but the truth was, there wasn't any of thatton the first pass, we said, Boy, these New Yorkers are really conservative.'' Eizenberg concurred, When everything is brick with sensible windows, you start to get a little worried.. In explaining their initial reaction, Santos proffered, We were very much a West Coast jury.. While Santos teaches at MIT, she is also a partner in San Francisco firm Santos Prescott & Associates; Eizenberg's practice Koning Eizenberg Architecture is based in Santa Monica, and Michael Pyatok practices in Oakland, California. Santos continued, In some ways, it's easier for us,, without the harsh climate, material constraints, stringent codes, and contextual pressures plaguing architects in dense East Coast cities. The L-shaped building shelters an interior courtyard. On closer inspection, the jury uncovered a group of projects whose stories go deeper than their practical brick walls. Among the award winners is Jonathan Kirschenfeld Associates' Marcy Avenue Residence, a Brooklyn home for the mentally ill, which the jury likened to the brick buildings of the Amsterdam School because of its carefully articulated faaade on which interior configurations are expressed by gestures such as recessed windows. Murphy Burnham & Buttrick Architects won an award for theiroriented toward a community garden across the street, and skylights within make the most of limited space. As the jury notes stated, These aren't cheap gestures, but [the architects] decided where to prioritize,, bringing an element of delight to this low-budget scheme. 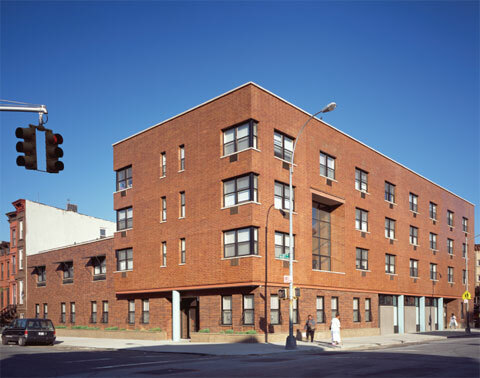 Another standout project, Melrose Commons in the Bronx, took root when Magnusson Architecture & Planning began pro-bono consulting for the client, Nos Quedamos ((we stayy in Spanish), a community group formed in 1993 to protest the city's Urban Renewal plans for Melrose. The project won an award in the Building Communityy category, more for the community-involved design process than for the buildings themselvesstidy rowhouses with sliver-sized front lawns, awnings, and orange-and-terracotta patterned faaades. 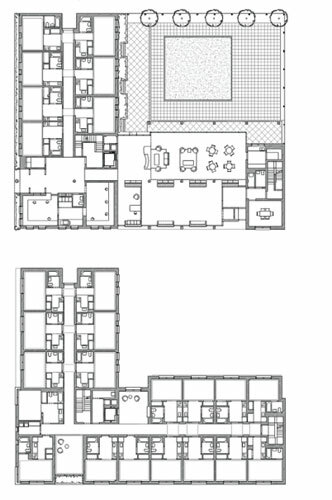 Ground-floor plan, top, and second-floor plan, below. Similarly, Murphy admitted of his firm's Habitat project, The architectural expression is not necessarily that exciting, but the result is exciting: The people who live there are now a close-knit group of friends because they worked on the houses together.. As Santos stated, There's always been some kind of ambiguity, as to whether housing is really architecture with a capital A.. And for this reason, Eizenberg posited, People who do housing feel a bit marginalized.. She concluded, I'm glad they're doing [this awards program]]the people working in housing need all the support they can get.. If McCullar has his way, this will only be the beginning. The New York AIA housing committee is in talks with the BSA about coordinating both cities' housing awards, with New York taking the odd-numbered years and Boston the evens. But for its inaugural year, the New York Chapter's Housing Design Awards was all about the home city: Following the same criteria as the New York Chapter Design Awards, announced on September 19, all of the projects had to be either by or for New Yorkers. Magnusson Architecture & Planning worked with community group Nos Quedamos to draw up a renewal plan for Melrose Commons, a 35-block area in the Bronx. 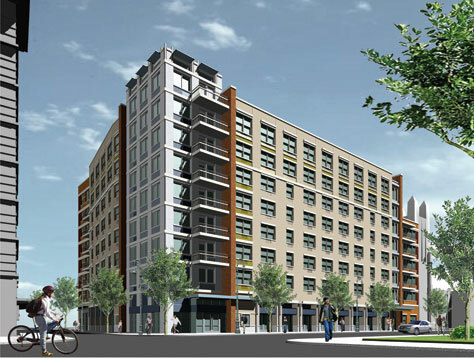 The plan includes several new residences, including a 95-unit coop (top) on 3rd Avenue between 158th and 159th streets. Anna Holtzman is a New York based writer and a former editor at Architecture magazine. She is completing a documentary about New York City's subway musicians.